remember a while back i made my daughter a new flower hair clip? you all asked for a tutorial then. you all asked how i made the flowers...well here you go. 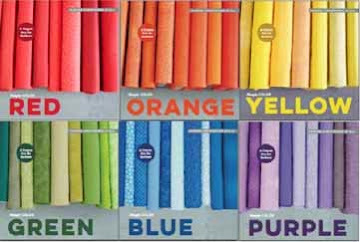 the basics on how to make the perfect add on flower to add just about anywhere you want to get a little extra pizazz. depending on how big you want your flower you will either add in width or take away in width. 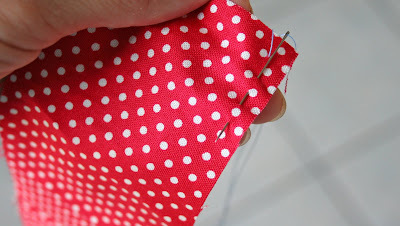 and you are going to do a loose running stitch at one side of your strip of fabric. do this the whole length of your strip. gently pull your thread as you go it will naturally start curling up. when all your gathering is done, tie off the end so it doesn't unravel. go through all three layers of your flower with your needle and thread so that it holds it's shape. 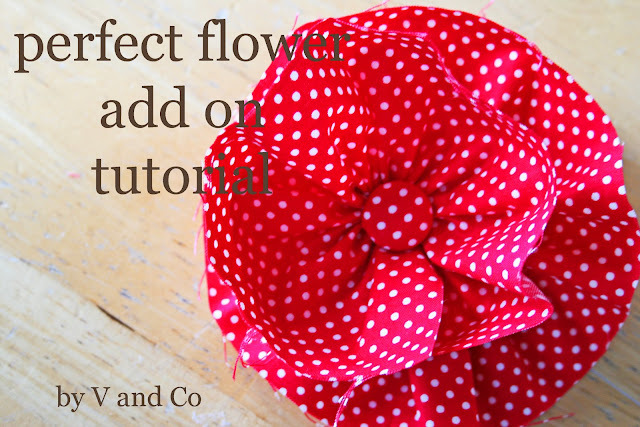 sew together your flower in the middle, a few times just to make sure it will stay put as it is. 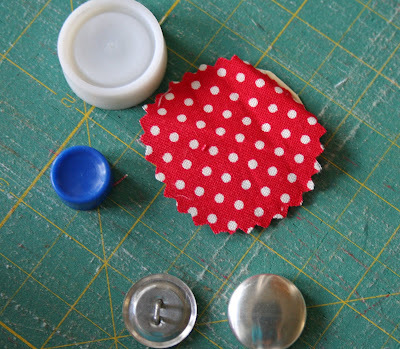 next you will want to make a fabric button. i used this kit the instructions are right on the package, and it has everything you need to make it. 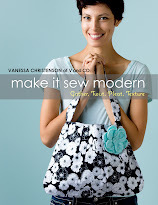 sew on your finished fabric button. 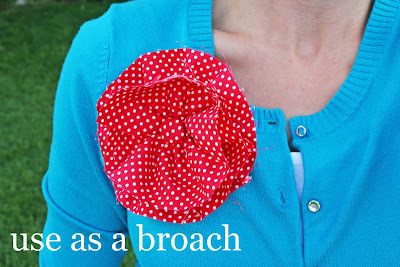 now you are going to attach your pin to the back of your flower. you can either sew it on or hot glue gun it. 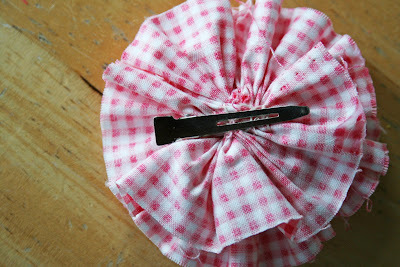 to make it into a hair clip i added a "single prong clip" you can sew or hot glue it onto the back of your flower. these can be found at any beauty supply store. if you make one make sure you put it on the Flicker group! 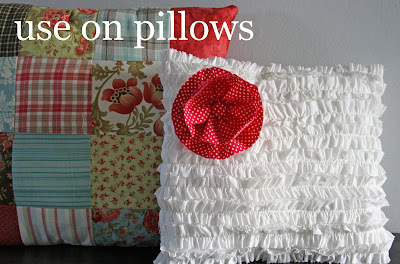 Looks easy enough... and it looks girly and cute on the pillow! Love it! thanks for sharing! will have to make several of these! so cute V!! you are much better at thinking 3D than I could ever dream i'll be... so i'm happy i "know" you.. so i can just make the things you come up with!! I love it! 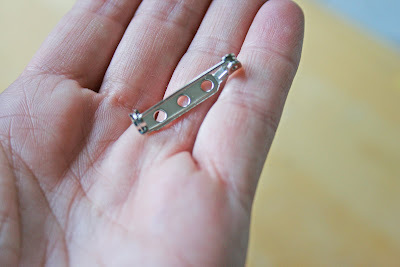 So adorable...but how do you keep the edges from fraying? How cute! I guess if you didn't want a frayed look you could zigzag or hem the edges, huh? Or put some "fray-stop" on the edge? Of course, the teens I know would love the fraying! Im with jaybird...I love making the things your mind comes up with!! Wonderful! Ohhh.. a covered button idea. I've only been making lots and lots of those buttons and am very addicted. 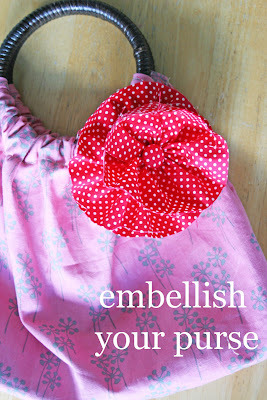 I don't have any little girls around any more, so I love the idea of the flower add on for a purse. A detachable purse! It'll be like the watches where you can just change out the band. You are so clever! 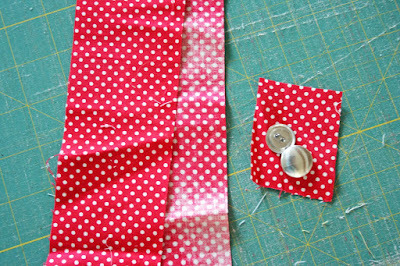 If you're into selvages, your tutorial would also work well for a strip of those, albeit with a little less gather. Just a thought! LOVE IT! i have been looking for something to finish a bag with! thanks. How pretty! Can't wait to make one. Thanks for the tutorial. AWESOME... LUV it!! I can't wait to make some! oh i ♥ it on katie's pillow!!! Ooh, thanks for the tutorial!! Lovin' it!! Great job! I love the flower pin on the white pillow. V...thanks for this awesome tutorial! These are so very sweet ! I used your idea of the mosaic and designed a new header for my blog. Go check it out and let me now what you think! Thanks for inspiring me! What a great tutorial! Thank you for sharing it~ SO CUTE. So cute! Can't wait to make a few. i would love these darling flowers on my flip flops! Super cute! Thanks for the tutorial. I'll be heading to the craft store tomorrow. I love to make things but have to rely on other people's ideas to copy! Thanks for sharing all your great ideas! 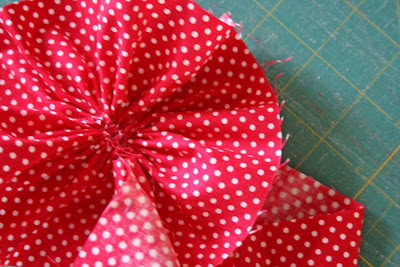 I love these bows---I've been wanting to make some for my daughter but didn't know an easy way. So easy and so cute. I also had a piece of wide gros grain ribbon and tried the method and it looked really cute even without a button! My daughter loves them! thanks again! Thank you for sharing this! It is darlin! Ohhhhh, so fabulous! I'll be adding this to our link luv roundup tomorrow! This is great! anyway, looks like you're keeping things as cute as ever. If this is the wrong vanessa, you know, sorry! otherwise, it's fun to "see you" via a blog stalk! Where oh where did you get the white ruffled fabric on that pillow? Love the use of the fabric button!!! Seriously lady if you give me one more cute project that I just HAVE to make I will scream (in joy)! I LOVE it. So simple, so sweet. OMG,.. this is TOO cute! 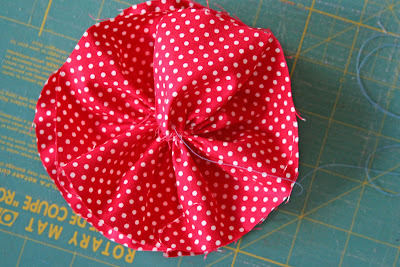 I am already making a pillow and I am totally adding one of these super cute posies!! YHANKS!! dang, your creative! i may actually attempt this!! Oh...this is so cute. Thanks for the tutorial! Your flower is just lovely with the covered button. I am book- marking this to put with the others. Just wondering on this flower, what keeps it from fraying on the outer edge of the flower?